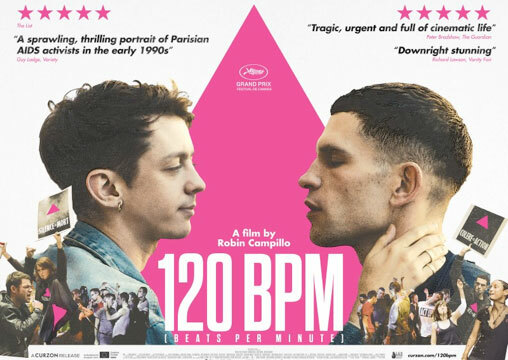 Written and directed by Robin Campillo (who also made the very good Eastern Boys), 120 BPM is a fictionalised take on the true story of the AIDS activist organisation, ACT UP Paris. Campillo and co-screenwriter Philippe Mangeot were involved with ACT UP themselves, helping to give the movie an authenticity and power it may otherwise have lacked. Thankfully though, despite being close to the story Campillo is objective enough to be able to acknowledge the flaws and problems within the organisation, while also having a clear-eyed view of why these things happened. This allows it to be a powerful and empathetic testament to both ACT UP and those who were/are affected by AIDS, without becoming hagiography. The film is initially seen through the eyes of Nathan (Arnaud Valois), a young gay man who attends an ACT UP meeting not really knowing much about it. He discovers an organisation that operates on its own rules (in a slightly cult-like way at times), but which is angry and determined to make a change. The group is furious about the French authorities’ reaction to the emergence of HIV and AIDS, and so arrange direct action against the government officials whose inaction they feel is causing thousands of deaths. They also target the pharmaceutical companies they believe are holding up promising new treatments. At the meetings Nathan meets Sean (Nahuel Pérez Biscayart), who becomes the focus of the movie. Sean is HIV+ and a veteran member of the group. The two start to grow closer and begin a relationship, even though at this point in the early 1990s there’s no effective treatment and Sean starts to battle increasing ill health. Click here to watch the trailer for 120 BPM. In the last few years there’s been a resurgence of films and documentaries about the AIDS crisis, such as Ryan Murphy’s screen version of The Normal Heart, the Aussie movie Remembering The Man, and David France’s Oscar-nominated documentary How To Survive A Plague. That’s partly because the people who came of age during the crisis and whose early adulthood was indelibly marked by the disease and the people they lost to it, are now middle-aged men able to get movies made. It is worthwhile though, as despite it only being a couple of decades on from this horrific time, many in their mid-30s and younger know little about it. Purely in terms of plot Campillo’s film covers many of the same bases as other recent movies and docs about HIV/AIDS, but what helps set it apart is the sense of spontaneity and immediacy. The film does a great job of putting you in the middle of what at times feels like a war. When ACT UP are raiding a drug company’s offices and vandalising them, even if you don’t agree with their methods the film pulls you into the struggle and why these people are doing what they’re doing. There’s little sense of this being a historical document. It also carefully ensures that this is about the people involved and not just about a disease or the events surrounding the AIDS crisis. Nahuel Pérez Biscayart is brilliant as Sean, bringing an immense humanity to the movie. It’s a finely balanced performance that shows the complexity of those involved with ACT UP, not least pondering how much of the anger directed at the authorities actually comes from their own anger and fear at their own situation and the knowledge they may die soon. Biscayart also ensures that we never lose empathy when the members of ACT UP are riven by infighting and sometimes seem like their own worst enemies. His relationship with Nathan is sensual, unafraid of the sexual and the cerebral. It is this which helps build to a truly powerful emotional crescendo which underlines the true tragedy of the AIDS crisis. It brings a grounded practicality to illness and death, which effectively underscores the humanity it’s dealing with. Overall Verdict: A beautifully put together look at the AIDS crisis in France and the people trying to do something about it. It’s a powerful film with great humanity and an incredible performance from Nahuel Pérez Biscayart.